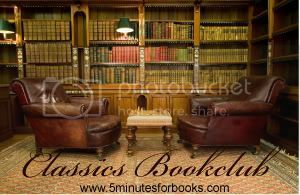 It's time for the first "meeting" of the Classics Bookclub over at 5 Minutes for Books. Jennifer announced the club in August and the first book for consumption is Jane Austen's very popular Pride & Prejudice. I had read it before, eons ago, but it's been so long that I didn't really remember what my reading experience was like. After the BBC version of the movie came out (and you know which one I am speaking of -- there is no other!) I became one of the millions of women who would rather pop in one of the DVDs than sit down with the book. And I thought nothing of it. When Jennifer suggested we kick off the Classics Bookclub with this work of art, I figured it was time to re-read it. Before I read P&P this time, I read Just Jane by Nancy Moser [review here] because I wanted to get a feel for who Austen was. (I've read all of Austen's works - now I've just to find out more about the woman herself!) I have appreciated doing that, although I know Moser's book is not an official biography or anything close. Moser did give me a feeling for who Jane was though and how who she was might have shone through in her writings. It was a nice thing to read before diving into this story yet again. I have to say now, having re-read Pride & Prejudice, that the BBC version with Jennifer Ehle and Colin Firth is magnificent in following the book. I hardly felt like I was reading the book at all, in all honesty! The scenes and characters are so firmly fixed in my mind now, thanks to that particular movie version, and the dialogue so close and on point that I can hardly tell the difference. I did, however, appreciate the fact that the book summarizes various relationships in a much more satisfying manner than the movie ever could. I really didn't walk away with too many surprises from the book this go 'round. I just enjoyed the characters as usual and basked in Austen's wit. An enjoyable read, a good first pick for the bookclub and all is well. Did you write up a post about this book and participate in the book club? If so, I'm sure I'll be seeing you around! I guess I'm going to have to get my hands on this movie lol. I rented the one with Keira Knightly, but haven't seen the other one. But 6 hours? Not sure how I'll sneak in that much t.v. time from dh and the kids. ;) Great post! I have that movie because I won an A&E Romance Collection DVD set on someone's blog a few months ago, so I'm definitely going to watch it soon. I can't wait to relive it. I agree that the movie is a wonderful adaptation. So many of the lines are word for word! I also agree that you should read the book first, but I also felt that rereading was even better after I saw the movie! Oh, I do love the A&E miniseries; nearly as close to the movie as you can get! But I also loved the Keira version too, though for different reasons (don't hate me!). I'll do not my best not to hate you, Lisa. BTW, I usually watch it in small incriments. An hour here, an hour there . . . it all works out in the end. My rule has always been to read the book before watching the film version. I drive my husband crazy if I read a book real close to a film because I sit through it and say, "that didn't happen in the book that way". Can't get him to watch P & P with me! I love the version with Collin Firth. It is very close to the book! I completely agree; there is only one real film version of this book, and it it is the BBC version! A note to Julie: It's hard, because you get hooked, but I found the best way to watch P&P when you don't have 6 hours for one sitting is to break it up into half hour or hour segments over the course of several days or several weeks. Carrie, if you loved this version of P&P you should check out the recent version of Sense and Sensibility. It's not 100%, but it's pretty close and much closer than the 1995 Emma Thompson version. You'd like it I think... oh except for one little thing at the begging. I heard about it, but missed it -- it's very brief and involves Willoughby. I have yet to watch the movie. Now I'm interested!! I'll have to see if the library has it in!! Great post!! I have the A&E/BBC mini-series out...I'm starting it tonight. :D Hubby is away on a business trip, so it's my chance to watch it without his "usual" commentary. I'm with lisa about the Keira version -- different but really excellent in its own right. It brings out elements of the story that I didn't notice in the A&E version and doesn't stereotype some of the characters quite as much. That being said, the A&E version is probably the "definitive" adaptation to see. First let me say, I really enjoying reading all your reviews and I have read many. Second... I agree with the following comment you made. "the BBC version with Jennifer Ehle and Colin Firth is magnificent in following the book". I just finished watching the BBC version and it is great! I also agree with you: "Austen is indeed witty even on film but in book form . . . ah! She was a master at the fine art of written communication. This book sometimes says so much while saying so very little. "